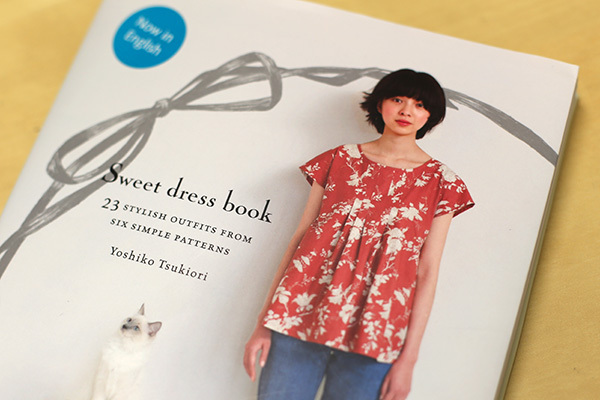 Laurence King Publishing (the same publishers of the incredibly useful DIY Couture by Rose Martin) recently were gracious enough to send me a copy of their newest sewing book, Sweet Dress Book: 23 Dresses of Pattern Arrangement by Yoshiko Tsukiori. 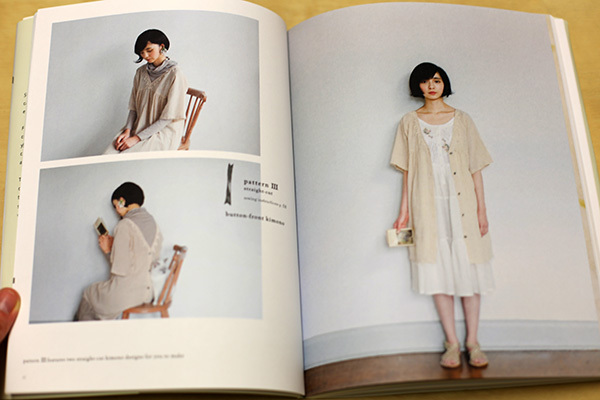 Translated from the Japanese, this pattern book features 23 tutorials for making a variety of blouses, tops, dresses, cardigans, and even shorts – all engineered from a basic 6 patterns with different darts, flounces, and lengths to switch up the silhouettes. 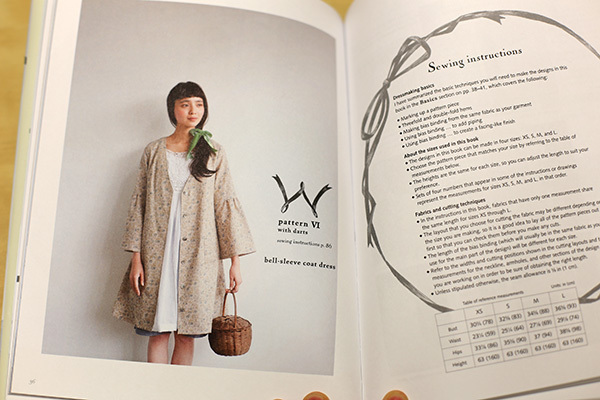 As is quite typical of Japanese sewing books, the designs are of course loose and flowy; they suggest the body shape rather than conform to it, which allows these pieces to fit on a variety of body shapes and sizes. 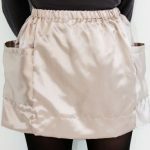 Many of the pieces have tiny details, like ruffles and gathering, that can read either girly or mature and feminine, depending on the styling. Also typical of Japanese pattern books, the patterns that came included overlapped each other on the paper, which necessitated re-tracing each pattern piece onto separate paper (and seam allowance was not included). 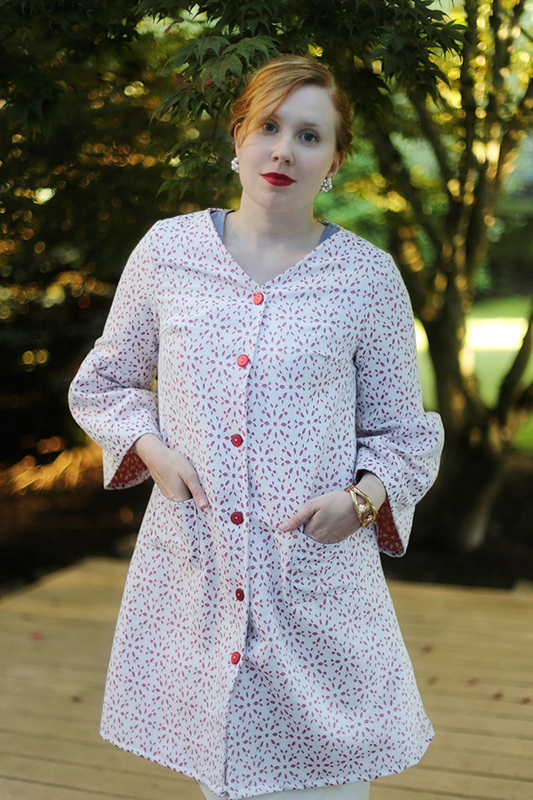 All the patterns and instructions were printed with both inches and centimeters, and the instructions included garment flats and technical illustrations to help with the sewing process. 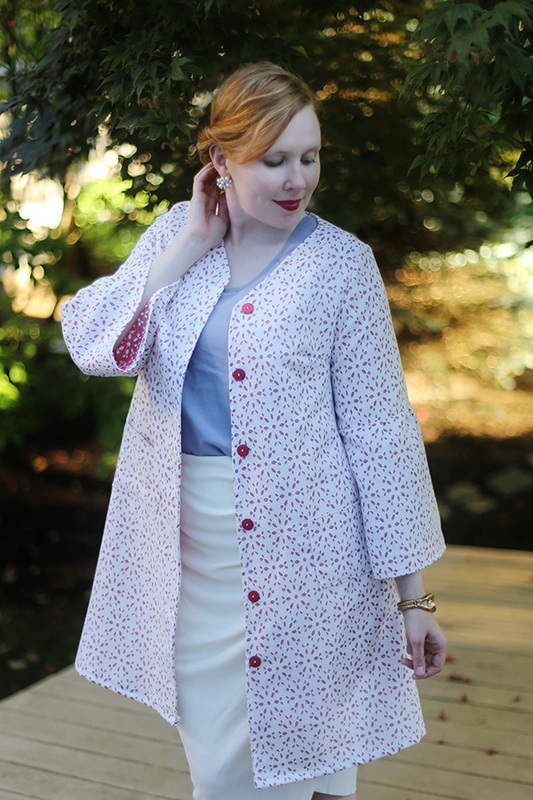 I decided to make Design W, the Bell-Sleeve Coat Dress, in a lightweight fabric for early Fall dressing, before it got too cold. I chose a faux cutwork lace-look denim in red from Jo-Ann Fabrics (called HH Hamptons, I believe), and adjusted the pattern slightly to create a higher neck (cutting to the Pattern V neckline instead of W). I also chose some brushed buttons in a dull red so they wouldn’t stand out too much against the coat. 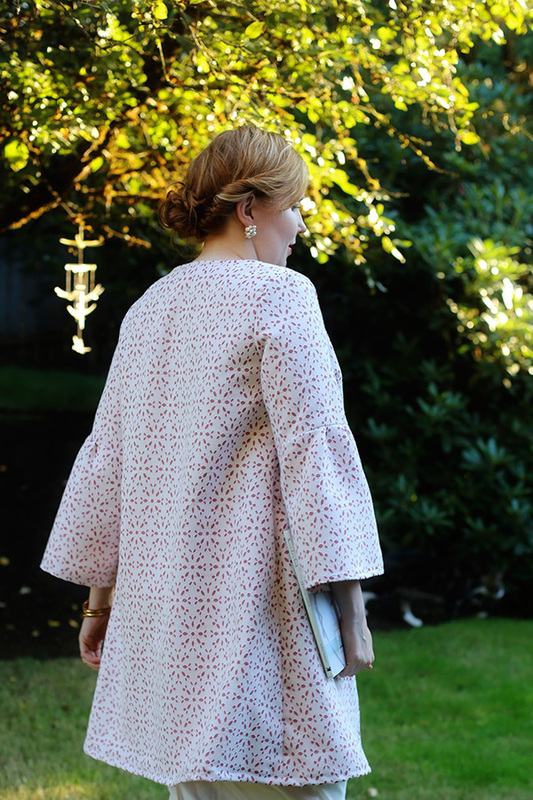 I made my coat in a Large size (the largest size on the patterns), and again, typical of Japanese patternmaking, found that on the finished piece the armscyes were slightly high, upper arms slightly tight, and sleeve length a little short. (I’ve run into this a lot with Japanese patterns, simply because their patterns are drafted to fit Asian bodies, and there are some small discrepancies between limb and torso length, shoulder width, front depth, and armscye height in Asian bodies vs. European bodies, though the difference is only a matter of less than an inch usually.) At a U.S. size 6 on top (8 on the bottom), I am already at the largest that can fit into this sizing, and really just barely at that. 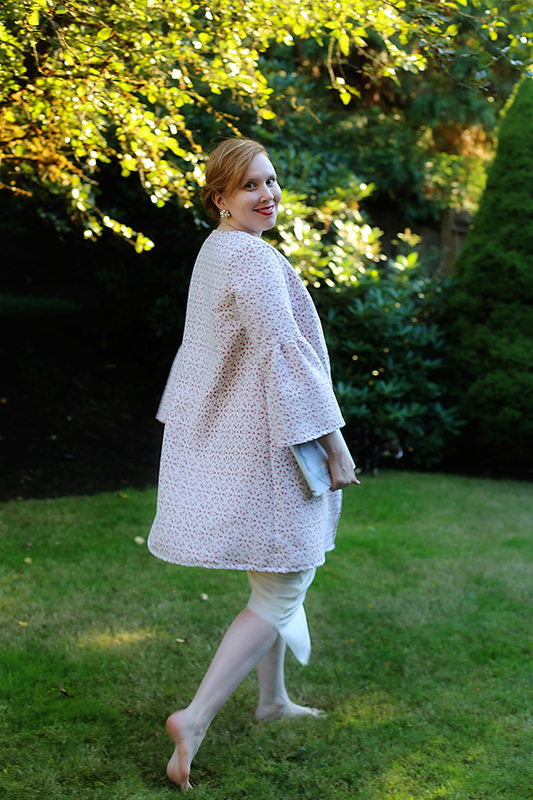 Though the coat is unlined (being a “lightweight” coat), I decided it would work well as a ladylike topper or as a chic layering piece (or even a dress on its own, belted and with short gloves! ), and recalled the pretty sorbet pastels and cutwork lace of the S/S ’12 Louis Vuitton collection. This was my first time using a book that was in English and translated from Japanese (rather than working from the original book [Japanese is my second language]). I found it fairly easy to follow, though because both inches and centimeters were included everywhere it made me have to be extremely careful in which number I was looking at. The translation was also very accurate, with none of the often-bizarre Japanglish one can find in books that haven’t thoroughly been edited by someone fluent in English. Plus the technical illustrations were very detailed and helpful (much better than the illustrations they include with store-bought patterns!). There were a few omissions of information (like buttonhole placement not marked on Pattern W), or a step missing (like turning the facing to the inside and topstitching), but not enough that you couldn’t infer what needed to be done from the detailed illustrations. 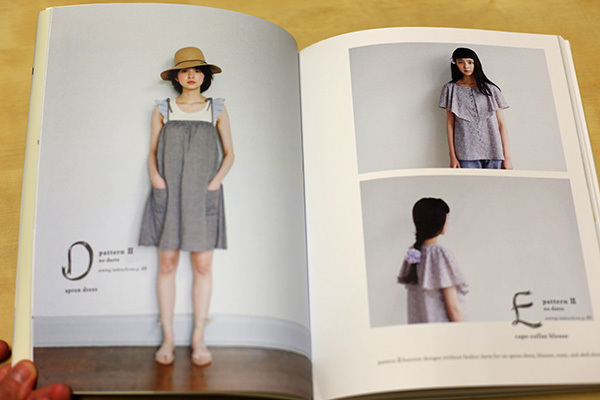 Even beginners to sewing could easily whip up something pretty from this book without much trouble. 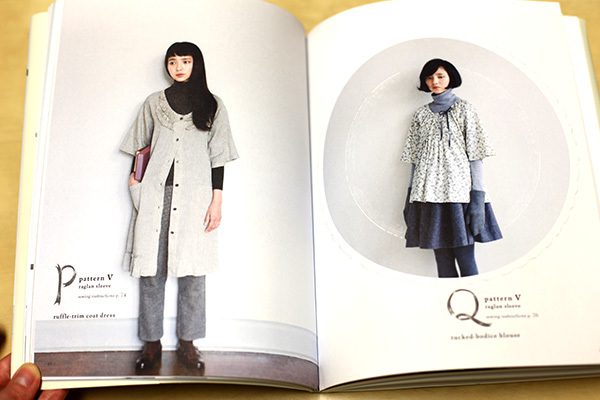 In short, the book is easy-to-follow, the patterns quick-to-make, supplying instant gratification, and the designs feminine yet understated. 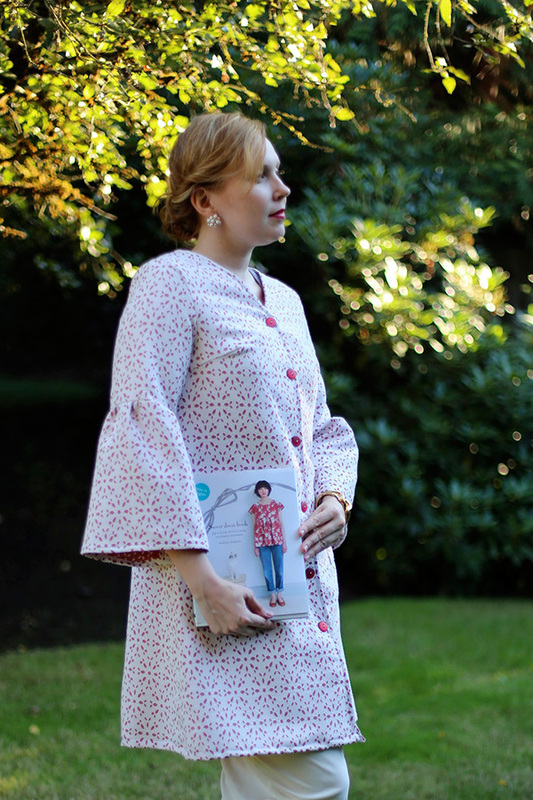 If you can fit into Japanese sizing and like the loose-fitting designs included in the book, Sweet Dress Book would make an excellent addition to your sewing room. 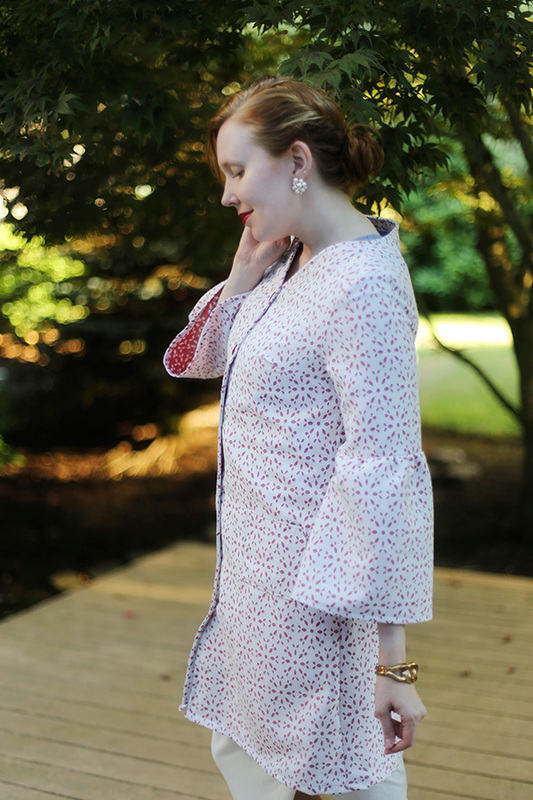 Next on my list: the gathered short-sleeve blouse and puff-sleeve dress. So adorable! Sweet Dress Book: 23 Dresses of Pattern Arrangement is available on Amazon.com or at other book-sellers nationwide. 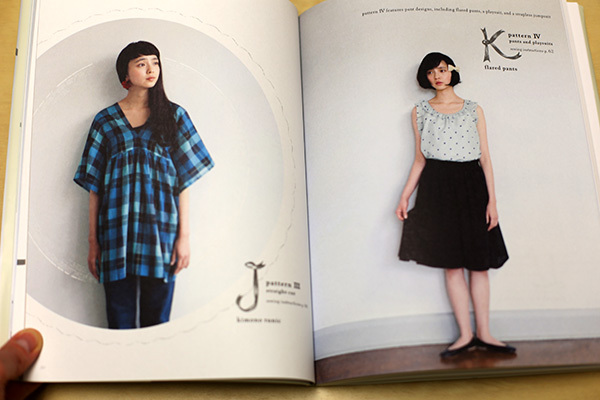 FTC Disclosure: I received one copy of Sweet Dress Book from Laurence King Publishing for review purposes. I have not been compensated for this review. The above statements are my own opinions. To read my full Disclosure policy, see here.